On pinterest today I saw a shirt that made me wonder and I was a little offended. It made me think about the idea of marriage and what is means to get married today. The shirt below portrays a groom as an object out for catching and I couldn’t help but wonder if that is what marriage has become. Are we so obsessed with getting married and finding our prince charming that it’s considered a game? 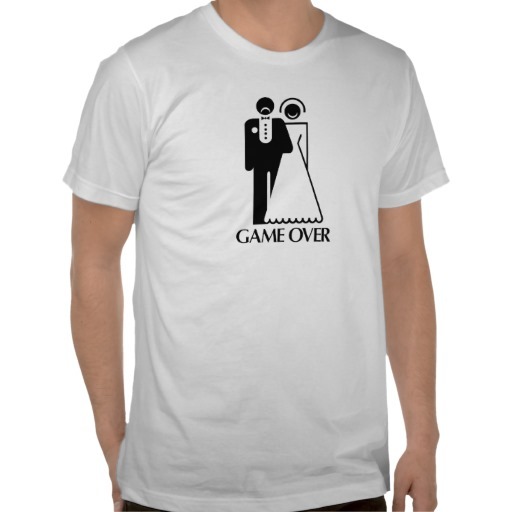 There is also a shirt for men (usually) that has a bride and groom with GAME OVER under it. Even for men, marriage is considered a game and something they should attempt to get or avoid. Where has the idea of marriage gone out the window to the point where we consider it game?